Who says flopsy-tailed bunnies are just for girls? 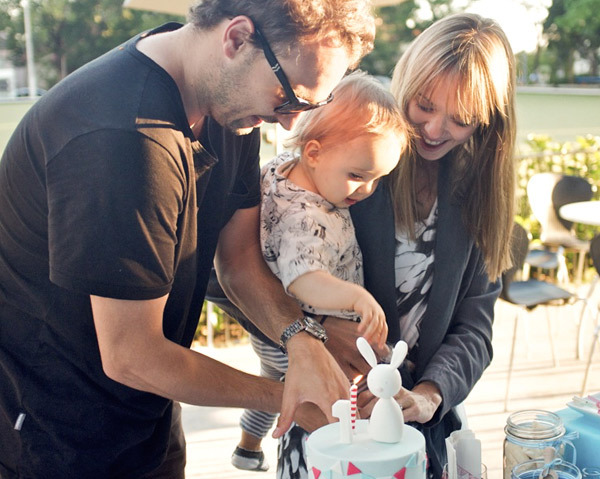 Here’s how to do a cute bunny-themed birthday, boy style. 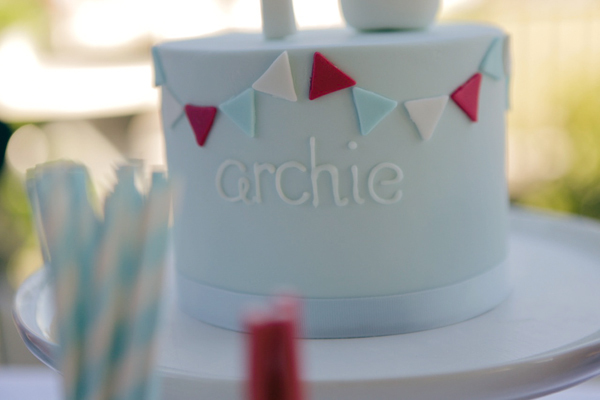 Totally different, but just as sweet as the Hunny Bunny birthday we featured last year, Archie’s boyish bunny birthday is as cute as, well, as cute as a bunny! 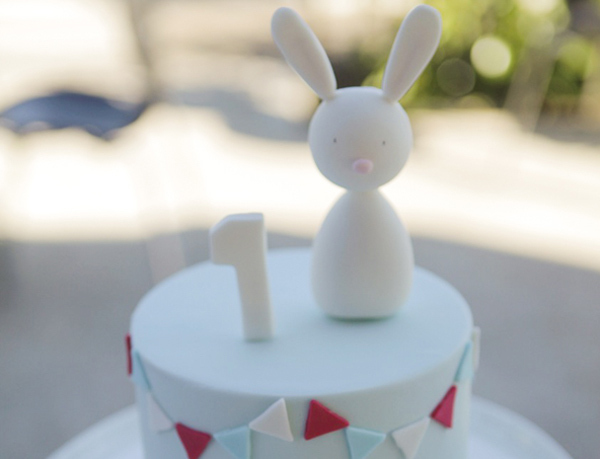 Throw in some cheery bunting, and you have a recipe for a perfect first birthday bash. Now here’s how mum Sally did it. 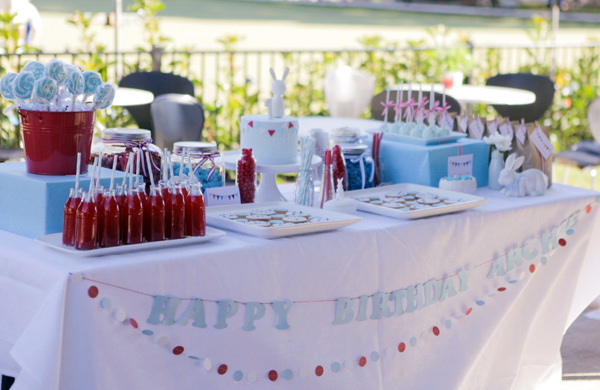 Sally sought inspiration from everyone’s favourite friend at party time – Etsy – to find the birthday invitation and all the party decorations, including the delicate confetti-like bunting and the happy birthday banner that adorn the sweets table. You’ll find them at Yellow Bird & Yellow Beard. The matching menu printables and thank-you tags pegged to the simple brown paper favour bags were another swell Etsy find, this time from Almost Sunday. Other bits and pieces came from Red Elephant Creative. 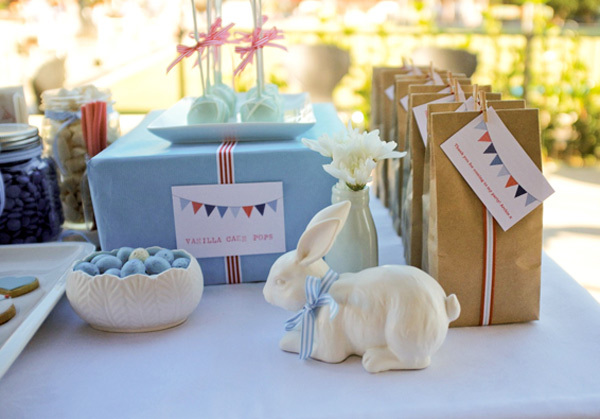 Sally wrapped plain cardboard boxes in some pale blue paper, a clever trick to give some height to the sweets table, which featured goodies including vanilla cake pops, giant lollipops, speckled bird’s eggs chocies and all sorts of lollies in eye-catching glass jars. 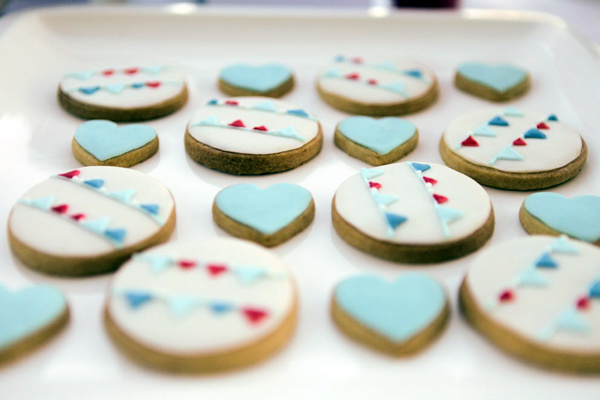 The adorable bunting and heart biscuits came from Polka Dot Cookies. Hello Naomi made the simply delightful cake, with its fondant bunting and jaunty bunny on top. Cute, cute, cute! Sally admits she was momentarily mortified at having to spoil such a lovely cake by running a knife through it. One bite though, and she soon got over it! Now let’s all give a big cheer to the birthday boy, pictured here with his parents as they get down to business on the cake .